Last Thursday I missed my favorite meeting of academics due to an unexpected mix up of scheduling. 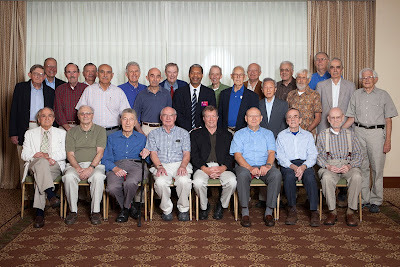 It was the annual meeting of Cornell University engineering emeritus professors hosted by the Dean of Engineering Lance Collins. The meeting is typically a delicious lunch at the Statler Hotel followed by an update of the activities of the College of Engineering by the Dean and concluded by a spirited exchange of views about the college. As you can see by the photos it is a geezer group. Probably many of them would be offended by the geezer designation but I make that appellation with all due respect to the wisdom of the assembly. Many of these distinguished individuals have received national and international recognition by various academic associations. These include the National Academy of Engineering and the National Academy of Sciences. Some are also recipients of honorary doctoral degrees. All in all they represent 1000's of years of distinguished engineering careers. I think it is extremely wise of the Dean to cultivate input from this group. Although some of the verbal exchanges can be sharp and occasionally contentious, the emerita and the Dean have a common goal of improving the College and its contributions to Cornell and greater society. As I gaze upon the picture of this group I cannot help to muse about what a photo of the next generation would look like. Note for the moment there are no women. Based on the current faculty of engineering make up, one could expect about one-third of the next generation to be women. Also based on current engineering faculty demographics the next generation will have Hispanic and African-American emerita. Whatever the case, any future Dean would be wise to seek input from the wisdom of the elders. (Since my blog supposedly speaks to the geezer skiers I should point out that the group pictured includes at least on downhill skier and several past and present cross country skiers).